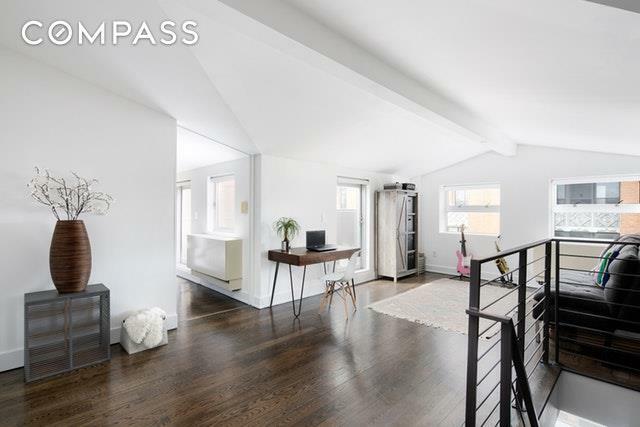 Located in a highly desirable pocket of East Williamsburg on a super charming block, Penthouse C is a bright and airy top floor duplex offering 1,143 square feet of interior space and 136 square feet of private outdoor space. Housed within a boutique elevator condominium, Penthouse C features seven large windows facing West and unobstructed vistas capturing blue sky and green treetops. Currently configured as a massive one bedroom, the property can easily be transformed back into a two bedroom home while still maintaining distinct living and dining areas. Enter Penthouse C and immediately feel like youve arrived at home. 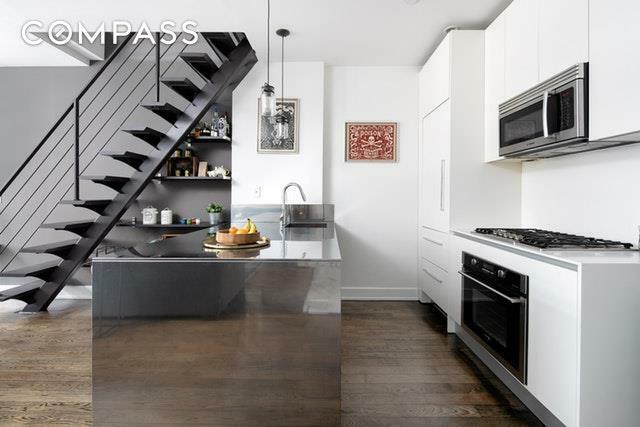 The 25 foot wide living and dining room is flooded with natural light and ideally connected to a beautifully renovated large open kitchen with a stainless steel island and a full suite of high-end, integrated appliances. 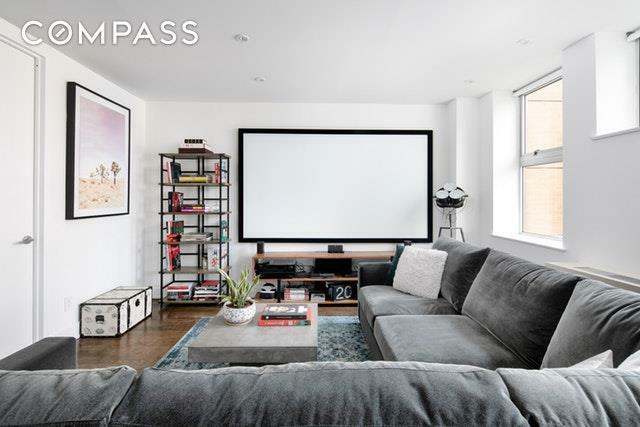 Opposite the kitchen is a proper dining area perfect for large dinner parties as well as a large living room which includes a proper projector and large scale theater screen. A crisp, spa-like bathroom with a deep soaking tub is also on the main level. Upstairs is an additional floor of versatile living space currently configured as the master bedroom, a wall of custom-built closets offering an abundance of storage and an additional 264 square feet of multi-use living space ideal for an office, studio space, secondary living room or an extension of the master suite. The beautifully landscaped private terrace is pin drop quiet and easily accommodates a grill and outdoor furniture. Other features of this unique property are in unit washer/dryer, a large entry closet and beautifully stained hardwood floors. 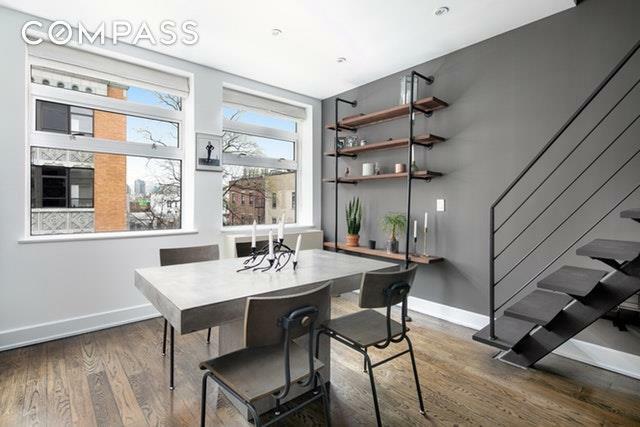 14 Monitor is a well maintained 24-unit condominium with incredibly low monthlies, a landscaped courtyard with seating and grill and a highly desirable location near McCarren Park. The best in nightlife, dining and retail are right outside your door with easy access to Graham Avenue, Williamsburg and Greenpoint. Listing courtesy of Gabi Wuhl of Compass.